I spoke at the BizTimes BizTech Conference and Expo this week. With only 45 minutes to make the case for using Twitter for business and showing a large audience how to set up, configure, grow, and use Twitter.com and all the tools, I was glad I covered as much as I did. As I was getting my slide show ready to post online after the event, I realized I was going to have to remove the slides I didn't get to in my presentation, because without the context and an explanation, I would look like a total nut case. Like the slides that talk about my dogs on Twitter. Yes, my two pups have a Twitter account. They are @kaleytzumuffet2. Even though they're both in the profile, only Kaley tweets. Miss Muffet is too dumb. 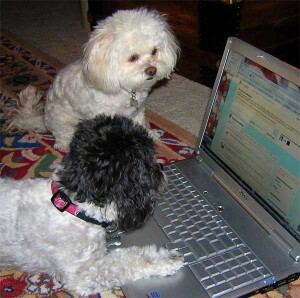 They tweet about life in our house from a dog's perspective. They post photos of their adventures. As you'd expect, they're incredibly cute, even when they're being naughty. Sometimes they even Tweet about things I say and do, that I wouldn't post on my own Twitter account. And while, like the writer of a recent AV Club article, you also may be asking: "C'mon! Dogs with their own Twitter page?" let me explain like I would have, had I not run out of time at my seminar. The first slide in that section shows a photo of a dog. Relevant to a Twitter seminar because the dog is on Twitter. I know he's on Twitter, because MY dogs follow him. I point out the fact that they follow him because his owner runs a local pet treat business. I also point out the fact that among my dogs' follows/followers are the likes of Petco, Cesar Millan (The Dog Whisperer), Pet Airways, Paw Prints Magazine and dozens of other businesses that cater to pet owners. Also among their many follows/followers are hundreds of other dogs, along with cats, fish, hamsters at at least one turtle. It all seems crazy until I disclose the secret: It's not really the animals who are Tweeting! It's really a bunch of humans who love their pets so much that they allow them to channel through Social Media. And so when Petco tweets a coupon, or Cesar Millan talks about what's going to be on the next episode of Dog Whisperer, or Doctors Foster and Smith report a missing dog in Rhinelander, it's a safe bet that a real human will see that Tweet, and not just act on the content, but also spread the word by Re-Tweeting to all their furry friends. The goal of Social Media as a business tool is to put a face on your brand. Usually it's a human face. But creative businesses know that by thinking outside the box, they can often identify and engage specific target markets. In this case, it's pet owners. They've figured out how to reach their market, and tap into its passion, and leverage its potential to create tremendous word of mouth. What's your target market? Are members identifying themselves as communities in Social Media? Are you finding creative ways to reach out to that market? I always say that Social Media is all fun and games until it impacts your brand. And while so many brands spend a lot of time finding out where their brand is being eroded, opportunities like this offer marketers a chance to use Social Media to proactively re-enforce their brand. Tweeting dogs, Crazy? Crazy like a fox! Tom Snyder is Founder, President and CEO of Trivera Interactive, a Midwest New Media firm. Tom is a Web guy, wine snob, music junkie, Ex-Milwaukee Radio Guy, HDTV expert, and political wonk. Business or Personal - What's your Twitter Identity?